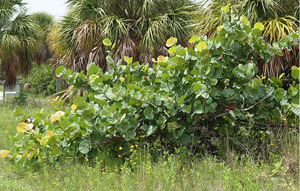 General Landscape Uses: Large shade tree in coastal areas. 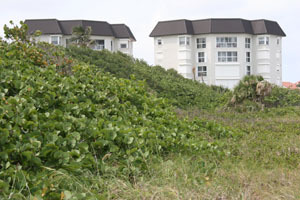 Formal or informal hedges. Also useful in buffer plantings. 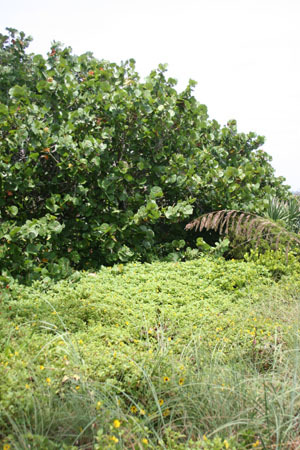 Ecological Restoration Notes: A key element of coastal forests, especially along the windward edge of maritime hammocks. Description: Medium to large tree with a rounded crown, often branching close to the ground. Trunks becoming massive, 1 1/2 feet in diameter or more. 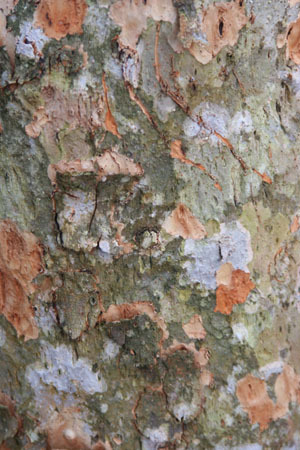 Bark light brown, splotchy. 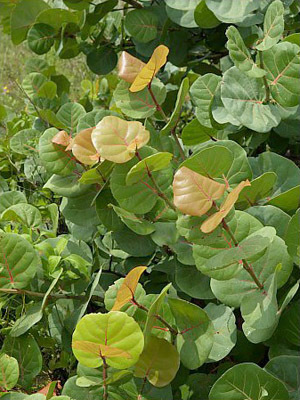 Leaves thick, large, roundish, 6-12 inches in diameter, with prominent red veins on both sides, brightly colored when emerging and just before falling off. Dimensions: Typically 10-50 feet in height; to 62 feet in South Florida. Often broader than tall. Range: Monroe County Keys north along the coasts to Brevard and Pasco counties, now spreading north and into the interior; Bermuda, West Indies, Mexico, Central America and South America. For a digitized image of Elbert Little's Florida range map, visit the Exploring Florida website. Flower Characteristics: Semi-showy, borne on long racemes, 6-14 inches long. 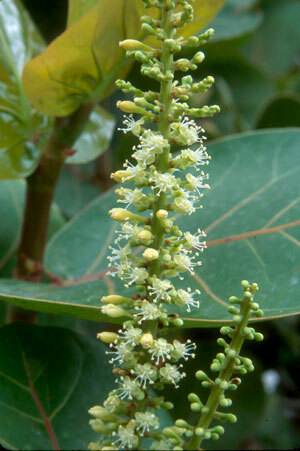 Essentially dioecious, with male and female flowers on different plants; sometimes male trees bear a few sterile fruits. Fruit: Berry-like achene, purple when mature. Edible, 3/4" long. 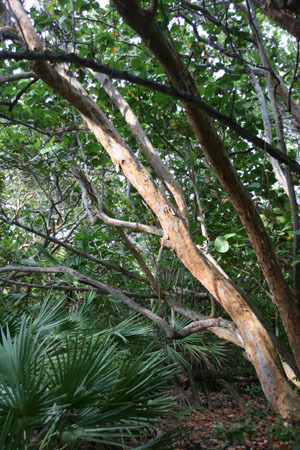 Wildlife and Ecology: An extremely important component of coastal ecosystems and one of the most salt tolerant native trees. Provides moderate amounts of food and significant cover for wildlife. Nectar plant for Florida duskywing (Ephyriades brunneus), julia (Dryas iulia), Schaus' swallowtail (Papilio aristodemus ponceanus), the introduced fulvous hairstreak (Electrostrymon angelica) and other butterflies. Larger wildlife eat the fruits. Comments: This is a very broad spreading tree - acting most often like a giant shrub. Forests of seagrape trees are sculpted by wind along the coast. 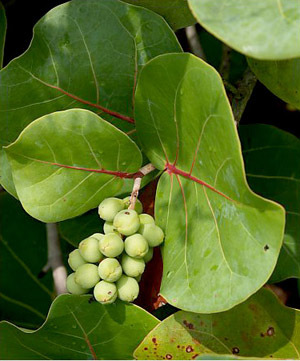 The fruits can be used to make jelly.